Olfactory groove meningiomas arise from the dura around the cribriform plate and can span the anterior skull base from the crista galli to the tuberculum sella, often involving the optic pathway and anterior circulation. While there are a variety of open surgical approaches to these lesions, it is important to select the optimal approach to provide adequate exposure of the tumor and involved dura, bone, and vasculature, as well as to allow for reconstruction and closure. Postoperative complications, including cerebral edema and cerebrospinal fluid leak, may be prevented by carefully selecting and planning an appropriate surgical approach for a given lesion. In 16.2, we review the merits and drawbacks of open transcranial approaches for olfactory groove meningiomas and discuss our recommended surgical approaches and management considerations. In 16.3, we demonstrate that the supraorbital eyebrow keyhole approach allows gross total resection of small- and medium-sized olfactory groove meningiomas. The cosmetic result is usually excellent. The complications rate is low. 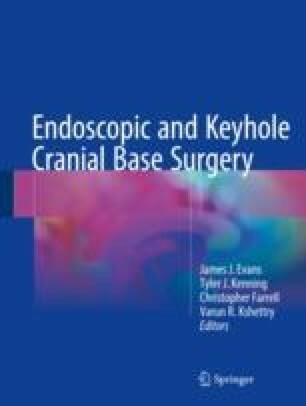 Because of the low height of the craniotomy, visualization of the olfactory groove requires frequently endoscope assistance especially when the olfactory groove is very steep. The rate of CSF leakage and loss of olfaction is lower than with the endonasal approach. Therefore, we consider the supraorbital eyebrow approach as the procedure of choice for most olfactory groove meningiomas. In 16.4, we demonstrate that olfactory groove meningiomas are lesions of the frontal skull base that also can be approached via a transcranial route from above or an endoscopic transnasal route from below. There are three main parts of transnasal endoscopic skull base approaches for olfactory groove meningiomas: the transethmoidal, transcribriform, and transplanum. The approach can be optimally tailored to the tumor size and surgical situation, with the opening as large as necessary but as minimally invasive as possible. There are special considerations concerning patient selection and surgical technique to make an appropriate decision about the optimal approach. A successful result will owe a great deal to careful patient selection, detailed planning, and a dedicated surgical team.